KCLU's John Palminteri reports on a dispute between the City of Santa Barbara and a business owner over the color of an awning. The City of Santa Barbara has been known for years as having strict design and construction rules. The owners of the Montecito Inn are coming up against those rules in an attempt to add an awning to their building on Coast Village Road. The Inn was damaged in the January mudflow, and the owners hastily cleaned up, repainted, and reopened to welcome guests. 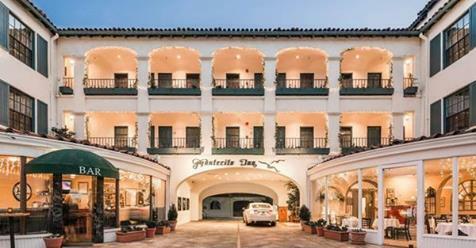 The owners of the Montecito Inn are trying to pitch a black awning over the door to their newest restaurant, Frankland's Crab Shack. The city says the Inn is a structure of merit, and black is not one of the colors allowed for awnings. The city has recommended dark green for the black and white building, but the owners have rejected that suggestion and are appealing that at a special hearing. A South Coast city may start including social responsibility in its investment decisions. The City of Santa Barbara is looking at adding a clause to its current policy which would discourage investing in businesses involved in weapons, tobacco products, nuclear power, and fossil fuel. The City’s Finance Committee developed the proposal which goes to the full city council Tuesday.